My name is Colby Stewart, and I play for Terrebonne High School. I was the QB this year, but I ran more than I passed. I played a little WR, RB, and LB as well. LAFM: 40 yard dash, max bench, max squat, max clean? I run a 4.68 40-yard dash. My max bench and clean are both 275. My max squat is 385. We had a lot of success in the beginning of the year. Our district is very tough, so we hit a rocky road once we got into district play. We ended up with a 5-6 record and made the playoffs. As a team we ran the ball really well on offense, and our defense made key stops in key situations. LAFM: What was your best game this season? My best game was against Central Lafourche. I rushed for 224 yards and 3 TDS as well as passed for over 100 yards and 2 TDS. Brian Westbrook- I have always been a Philadelphia Eagles fan. He was a great dynamic player, and I try to emulate my play after his. I was 7 years old when my dad asked me if I wanted to play. It was little league tackle at a Terrebonne recreational league. I always looked up to my dad growing up. He played at Terrebonne when he was in high school, and then went on to be a 4 year letterman at Nichols as a MLB. My dad is there for me on and off the field. He is always there to guide me through all my decisions. I am not sure exactly what I want to do. I either want to go into engineering or something in the medical field like an anesthesiologist. Nichols has been inviting me to games. A few D3 Schools such as Occidental college in California want me to play for them. My high grades kind of hurt me because I am eligible for Tops and Scholarships. Because of that, in-state schools such as LA Tech, ULL, and ULM want me to walk on. 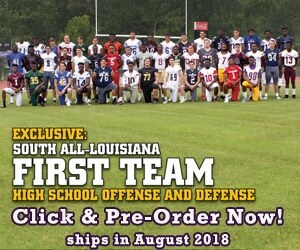 I would like to try to walk-on at LA Tech or LSU. I think I would play either a slot WR, OLB or S. My favorite position to play is RB. I like to run the ball and RB’s get to go with the flow of the game which is enjoyable to me. LAFM: What was something special about your team this year? I really appreciated our O-Line this year. They were a big reason I was able to rush for over 1500 yards. Also, we are really the only team in our area to make the playoffs as many times as we have in the last several years. We have made it 3 of 4 years I have played, and I think 5 of the last 6. Our coaches have done a great job. LAFM: Outside of football, what makes your school special? We have a good academic program and are involved with the community. We try to do everything we can to help out our area and each other.